Jesús Perio 7042. Classic, beautiful, timeless designer wedding dress. Would fit size 8-12. I am a size 10 and fitted me perfectly. Absolutely stunning dress that can be accessorised to be more formal or less for a relaxed style. The material and structure of the dress makes it incredibly comfortable but very flattering. The top half is a beautiful ivory colour, structured yet relaxed without any uncomfortable boning or seams. The straps can easily be adjusted to suit your height- there has been material left to bring the back lower by making the straps longer. 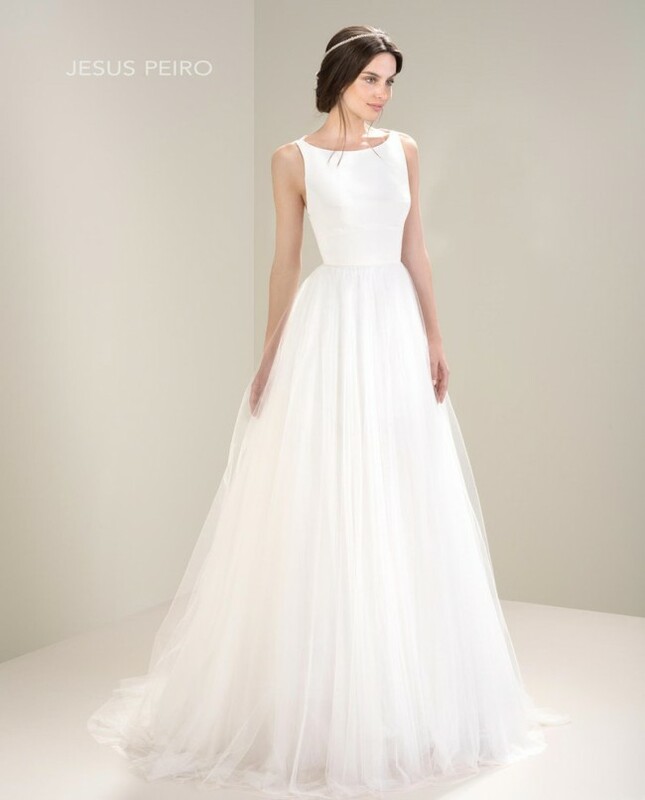 The skirt is in layers of delicate, soft, ivory tulle. This material flows beautifully; a seamstress could easily cut this to your height if necessary. This was bought from a bridal boutique, specialising in Jesús Perio dresses and was hand made in Italy. Only worn once and dry cleaned. It comes with the designer’s bag and hanger. The veil and belt shown in the photographs are also available if you would like them. The belt is by Jesús Perio and veil, bought from the same boutique so matches perfectly. Belt is not attached to the dress. You’d be very welcome to come and try the dress before making a decision, please get in touch. I also have a few other accessories you can try with the dress- other belts and head pieces. Any questions please get in touch. Thank you. Straps taken up but can easily be taken down again without any damage or notice. Once you send a message, Kiera can invite you to purchase the dress.